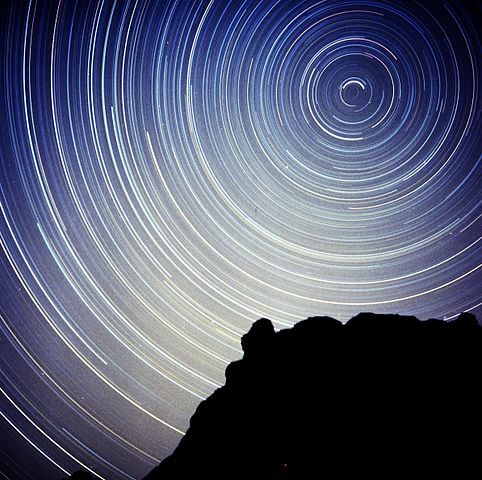 Circumpolar stars stay above the horizon all hours of the day, every day of the year. Circumpolar stars neither rise nor set but always remain in the sky. They’re up even in daytime when you can’t see them. 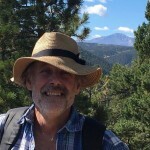 For instance, the stars of the famous Big Dipper asterism are circumpolar at all latitudes north of 41 degrees north latitude, which includes the northern half of the mainland United States and most of Europe. From the northern U.S., Canada or similar latitudes, the Big Dipper is circumpolar, always above your horizon. 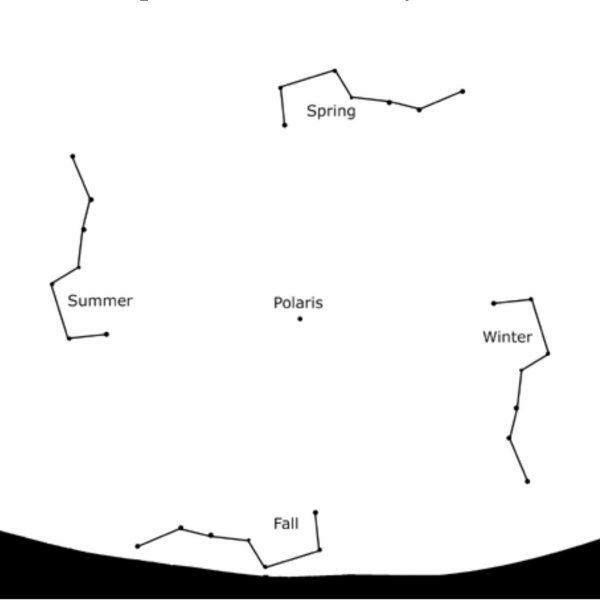 Image shows Big Dipper at midnight at various seasons. “Spring up and fall down” for the Dipper’s appearance in our northern sky. It ascends in the northeast on spring evenings and descends in the northwest on fall evenings. 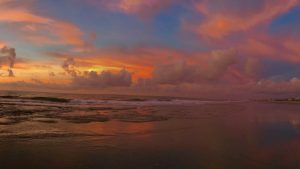 Image via Night Sky Interlude – Spring Skies. How many circumpolar stars appear in your sky depends on where you are. At the Earth’s North and South Poles, every visible star is circumpolar. At the Earth’s North Pole, every star north of the celestial equator is circumpolar, whereas every star south of the celestial equator stays below the horizon. At the Earth’s South Pole, it’s the exact opposite. Every star south of the celestial equator is circumpolar, whereas every star north of the celestial equator remains beneath the horizon. At the Earth’s equator, no star is circumpolar because all the stars rise and set daily in that part of the world. You can actually see every star in the night sky over the course of one year. Places in between the equator and poles have some stars that are circumpolar, some stars that rise and set daily (like the sun), and some stars that remain below the horizon all year round. In short, the closer you are to the North or South Pole, the greater the circle of circumpolar stars; the closer you are to the Earth’s equator, the smaller the circle of circumpolar stars. We in the Northern Hemisphere are lucky to have a moderately-bright star, Polaris, nearly coinciding with the north celestial pole – the point in the sky that’s at zenith (straight overhead) at the Earth’s North Pole. Draw an imaginary line straight down from Polaris, the North Star, to the horizon, and presto, you have what it takes to draw out the circle of circumpolar stars in your sky. In the Northern Hemisphere, an imaginary vertical line from the north celestial pole to your horizon serves as a radius measure for the circle of circumpolar stars in your sky. The closer you are to the Earth’s North Pole, the closer the north celestial pole is to your zenith (overhead point). For people in the Northern Hemisphere, Polaris nearly pinpoints the center of the great big circle of circumpolar stars on the sky’s dome; and the imaginary vertical line from Polaris to the horizon depicts the radius measure. (See the above chart, which has this line drawn in for you.) Let your arm serve as a circle compass, enabling you to envision the circle of circumpolar stars with your mind’s eye. Closer to the equator, the circle of circumpolar stars grows smaller; nearer to the North Pole (or South Pole) the circle of circumpolar stars grows larger. Star-hopping to south celestial pole via the Southern Cross and the bright stars Alpha Centauri and Hadar. Read more: Use the Southern Cross to find due south. The Big Dipper and the W-shaped constellation Cassiopeia circle around Polaris, the North Star, in a period of 23 hours and 56 minutes. The Big Dipper is circumpolar at 41 degrees north latitude, and all latitudes farther north. By the way, Cassiopeia lies on the opposite side of Polaris from the Big Dipper. 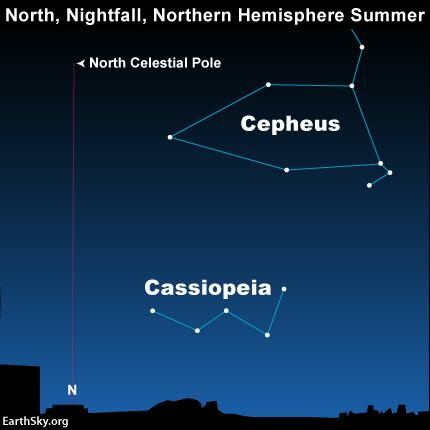 So from mid-northern latitudes, the Big Dipper and Polaris help you to locate Cassiopeia. See the above animation, in which all the stars revolve full circle around the celestial pole each day – or more precisely: every 23 hours and 56 minutes. If Cassiopeia is circumpolar in your sky, then the Southern Cross never climbs above your horizon; and conversely, if the Southern Cross is circumpolar in your sky, then the constellation Cassiopeia never climbs above the horizon. As seen from the tropics (and subtropics), neither the Southern Cross nor Cassiopeia is circumpolar. 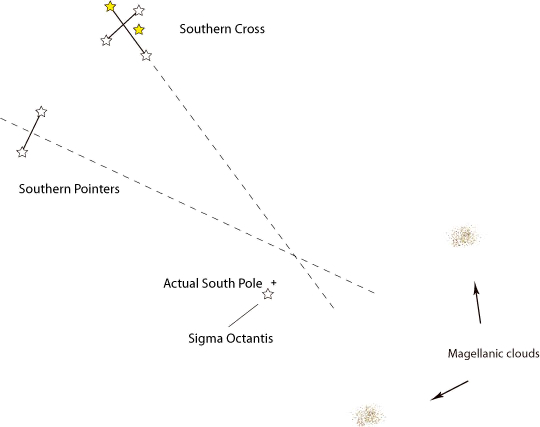 From this part of the world, the Southern Cross rises over the southern horizon when Cassiopeia sinks below the northern horizon; and conversely, Cassiopeia rises over the northern horizon when the Southern Cross sinks below the southern horizon. Sky wheeling around Polaris, the North Star. Image via Shutterstock. Bottom line: Circumpolar stars stay above the horizon all hours of the day, every day of the year. Although you can’t see them, they’re up even in daytime. 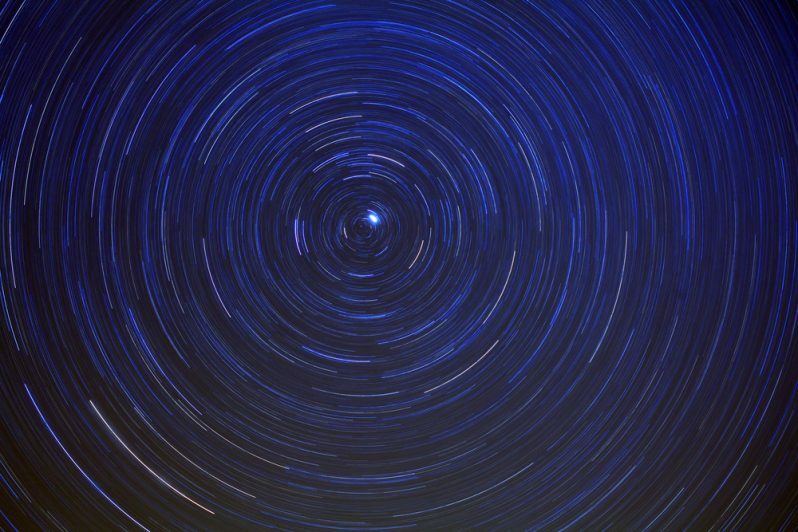 Read more: What are circumpolar stars?